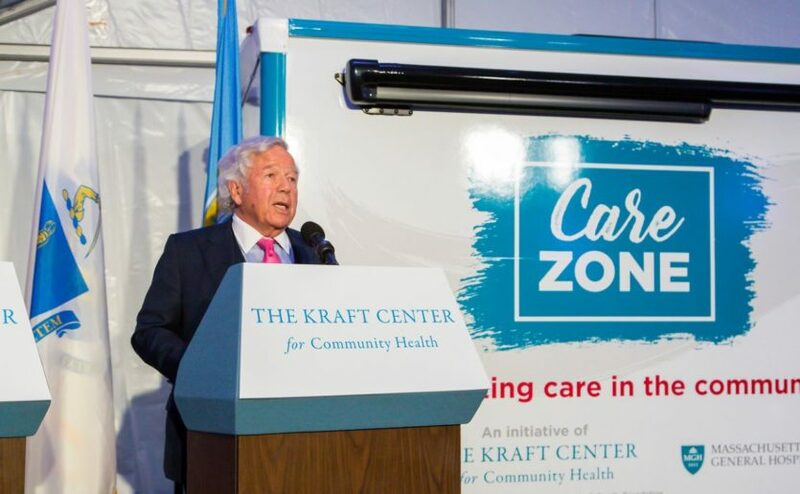 Robert K. Kraft says CareZONE is designed to "provide the hope of recovery to people who may feel unnoticed by our society and who are in need of care. " The CareZONE mobile health van aims to better engage individuals struggling with addiction and complex health conditions. The Kraft Center for Community Health at Massachusetts General Hospital recently unveiled CareZONE, a mobile health van aimed at better engaging individuals struggling with addiction and complex health conditions. The CareZONE van will provide care and harm-reduction services in areas of Greater Boston known to have high rates of opioid overdoses. For CareZONE, The Kraft Center is partnering with the GE Foundation, Boston Health Care for the Homeless Program and AHOPE, a program of the Boston Public Health Commission, with support from the Massachusetts Department of Public Health, The Hearst Foundation, Partners HealthCare and Ford Motor Company. This community outreach initiative will focus on providing care and harm reduction services in areas in Greater Boston known to have high rates of fatal and non-fatal opioid overdoses. Its goal is to increase access to addiction and healthcare services, engage individuals in recovery and connect them with long-term, community-based care. The Kraft Center was established in 2012 by a generous gift from Mr. Kraft and The Kraft Family Foundation to expand access to high quality, cost effective health care for disadvantaged populations. The national opioid epidemic has claimed hundreds of thousands of lives with death tolls increasing 400 percent since 2000. In Boston alone, overdose deaths have almost tripled in the last five years. While lifesaving treatments for opioid use disorder are available, only five percent of people living with substance use disorders have access to the treatment they need. CareZONE will be staffed by BHCHP’s medical group and AHOPE’s harm reduction team. It will provide on-demand, preventative care, such as screenings for tuberculosis, cancer and sexually transmitted infections, immunizations, and chronic disease management including HIV. It will also offer low-threshold treatment for substance use disorders and will offer an opportunity for individuals, many of whom are homeless, to receive overdose prevention and risk reduction counseling. Elsie Taveras, MD, MPH, executive director of The Kraft Center, said an average of six people per day are dying in Massachusetts from an opioid overdose, the fundamental cause being the disease of addiction. “Effective, lifesaving treatments are available now but there is substantial lack of access to treatment, particularly among our most vulnerable populations,” Dr. Taveras said. “There is also reluctance of many people to use traditional clinics or hospitals due to fear of stigma. That is the space we hope to fill with the CareZONE program. Elsie Taveras, MD, MPH, executive director of The Kraft Center, visits the CareZONE van at its recent unveiling. As part of these efforts, The Kraft Center enlisted the assistance and advice of key community leaders, first responders and healthcare providers to help develop, plan and implement a cutting-edge program that would address some of the unmet health care, mental health and addiction service needs of individuals in Boston with substance use disorder. Through this work, CareZONE aims to connect patients to a permanent medical home and facilitate access to critically important, consistent care. To learn more about how you can support the Kraft Center and other community health programs at Mass General, please contact us. Help develop and spread the best solutions to community health challenges.